If you’re about to travel to India and don’t know where to begin your food journey, this is probably one of the best things to start of with- the Thali. It is a meal- lunch or dinner, served on a stainless steel plate or on a banana leaf. 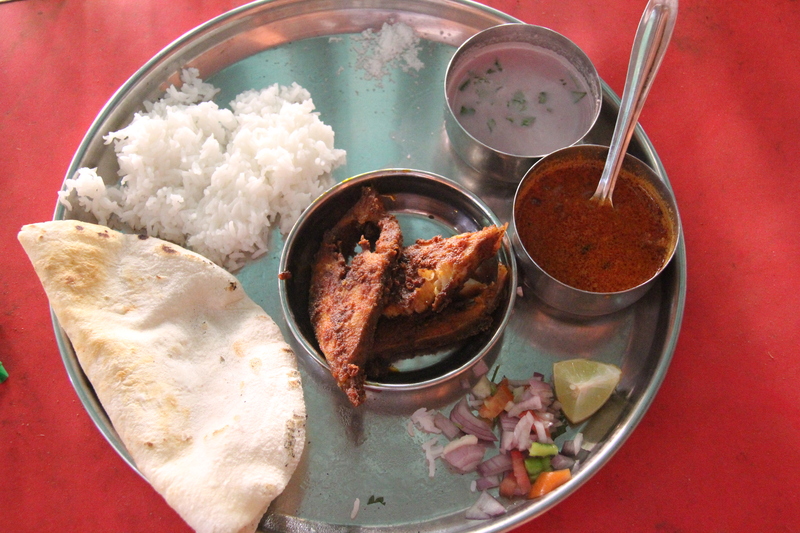 The word thali also means the plate on which the meal is served. In most cities across India, it is an inexpensive way to stuff yourself silly, with unlimited quantities of rice, vegetable curries and lentil soups. Or if you opt for a non-vegetarian thali, you’ll have sea-food, chicken and lamb staring at you lovingly and urging you to make the rest of the sights wait till you’ve had thirds. Here is all you need to know to order and eat a Thali, and gently drift into a food coma. The thing with restaurants that serve Thalis is that there is no menu. Especially in the vegetarian-only ones. The places that specialize in non-veg dishes, may give you an option; chicken, mutton or fish! There’s no more information you will get till you see the food coming at you –about 5 dishes every 2 seconds. What the chef decides to make that day is your meal. And usually he likes to make a lot. 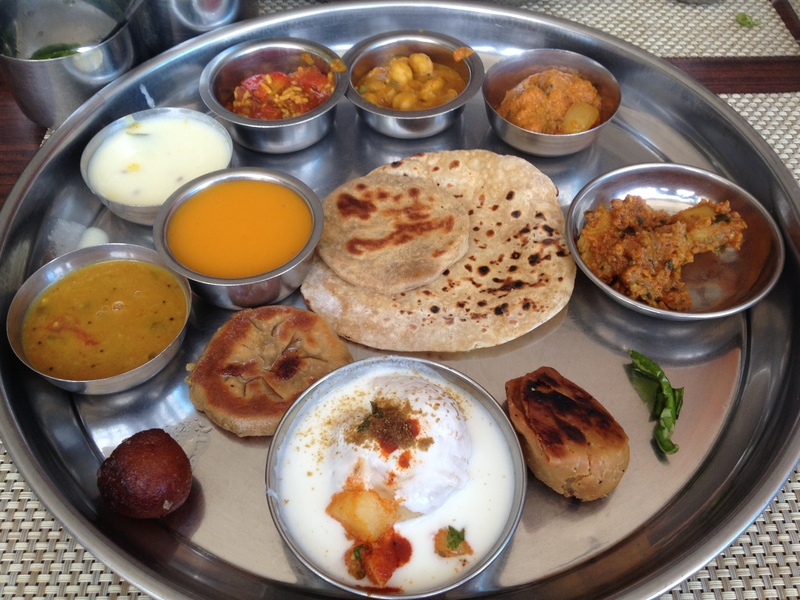 A vegetarian ‘unlimited’ thali usually has at least 10 dishes. In fact, it’s all such a wonderful surprise, they should change that whole phrase to ‘life is like a thali meal’. First no menu, now this?? I see you wondering whether this whole Thali bit exists or is just a figment of ones imagination. But there’s no need to panic. Indians eat with their hands. But if you really can’t manage it at all, you can always ask for a fork and spoon and the waiters who’re extremely happy to serve a foreigner will oblige. If you choose to eat like a local, just head to the wash basin before you get served. You must eat with your right hand only (the left hand does things that cannot be mentioned in a food post). And use the left to pick up the little bowls of curries et all and serve them in the center of the thali where all the joyful fingers-to-mouth-scooping of morsels happens. If you’re left handed, now’s the time to practice ambidextrousness. Food isn’t served, it’s heaped. Ahem! There is no serving bowl from which you serve yourself either. The waiters will serve you. Each waiter is in charge of a course of dishes, so in what looks like a synchronized, whirlwind food dance, each one of them will fill designated areas of your Thali with his course. 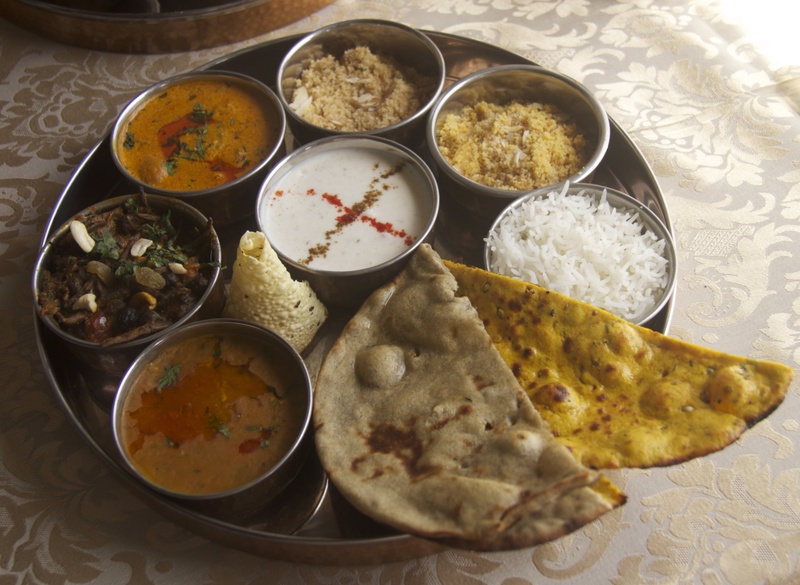 In a vegetarian thali, you will first be served small amounts of pickles, salt, yoghurt, cool raita (yoghurt with vegetables or boondi, fried lentil flour), poppadums, puris, two to three crunchy- savoury snacks and dessert (which is usually a choice of at least 3). These are just the main accompaniments. The food is yet to come! Depending on which region of India you’re in, the next onslaught, usually two types of each; will be lentil soups or daals, vegetables in a curry form, vegetables in a dry form, rotis (flatbreads), more fried veggies and breads. As soon as you start eating this, you will be offered more. Don’t worry, it’s normal! We’re obsessive about replenishing food from the first bite. Breathe! Quickly! Now eat non-stop for at least 5 minutes till your next breath. Just kidding. You can go at your own pace, eager-to-serve-you-more-waiters notwithstanding. 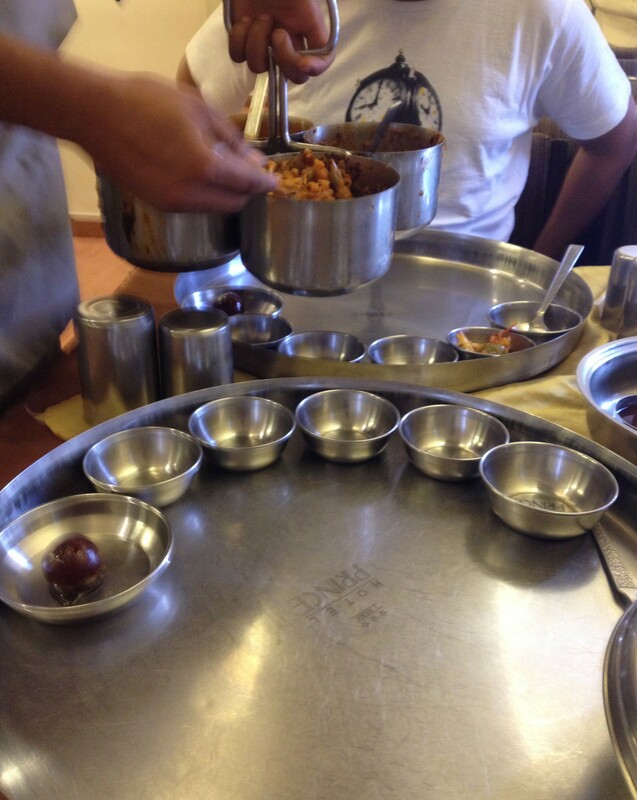 Take your time, taste all the small little bowls of food circling your thali and see what you like. The general rule is to scoop out the dry or wet dishes with the flat breads. Mix some (tiny amounts) pickles to your morsels. Or mix and match crunch with perfectly cooked curries. It’s all up to you. When the rice comes, you’ll know it’s approaching when you see a waiter with a bucket of it! Rice is usually shoveled, politely into the center of your Thali. Hold up a hand to tell him to stop. Or he will empty the bucket into your plate. You will be asked whether you want some clarified butter on it. Nod your head vehemently and say yes. Believe me, you have not discovered the joy of eating rice till you’ve mixed a little ghee into it! Taste this first before you add any curry or dal into it. And you’ll thank me. Once your eyes are open from this deep, sudden love for ghee, give the curries a try. Mix them in, add some dry veggies, dollop some curd, crush some poppadum over it and eat away. How to ask for more. And more importantly how to ask for mercy! Here’s another use for your left hand. If you find yourself quieted with a mouthful of food and a waiter heaping more into your plate, gesture with your hand for him to stop. In fact always tell the waiter when to stop serving you a particular dish or all of it. We usually finish what’s in our thalis and hate to waste. If you’re not used to this much food, it might get overwhelming. And if you want more of anything, any finger of any hand pointing to any of the bowls will do the trick quite quickly. You will soon realize that you’re not alone. A full mouth and vigourous pointing are the it moves of the diners around you and will earn you instant approving smiles from the staff too. you have put it in so many words and that to beautifully…..